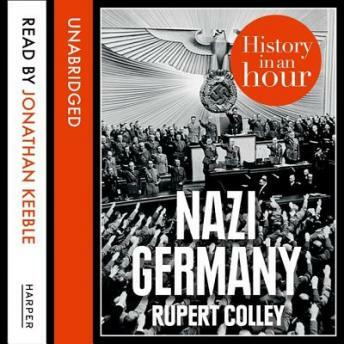 Listen to this bite size audiobook about Hitler's experience as a soldier during World War One, the Nazi Party's climb to power, the elimination of their political opponents and the Weimar constitution. Learn about life in Nazi Germany, for women, the family, the Jews, and the use of state control, propaganda and security. See how Hitler manipulated foreign policy to achieve his aims, and how he brought the world into war. Nazi Germany in an Hour tell you everything you need to know about Germany under Nazi rule, in just one hour. Know your stuff: read about Nazi Germany in just one hour.